Voting in all categories of the NME Awards 2014 with Austin, Texas has now opened – click here to start casting your votes. It’s that time when we call on you, the readers, to give your favourite band the finger. 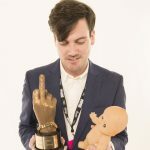 On February 26, 2014 at London’s O2 Academy Brixton the great and good of the music world will gather to find out who’s taking a fist shaped finger-flexing statue from the NME Awards 2014 with Austin, Texas. The awards will be handed out at a glittering ceremony at London’s O2 Academy Brixton on February 26 – so make sure you have your say. From your nominations we’ll compile a shortlist for each category. The winners will then be decided in a second vote on NME.COM in the new year. Voting closes in January 2014. Meanwhile, our annual NME Awards Shows, with Austin Texas will be happening throughout February in the run up to the ceremony. The initial line-up of gigs, which also includes headline dates from Parquet Courts, Swim Deep and Warpaint, was announced last week and will take place at various venues around London between February 2-25 next year. The NME Awards shows, with Austin Texas are on sale now, click here for full line up and tickets.